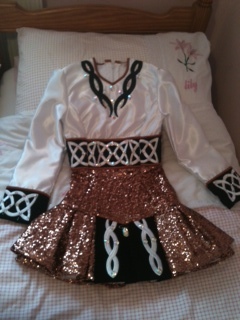 Brand new/unworn bright white satin dupion and copper sequin solo costume. 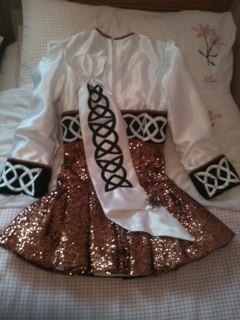 The copper sequin has a bit of give for a nice fit, the dress is also very light weight. 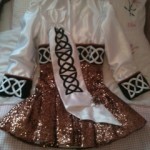 The celtic embroidery is accented with large Swarovski stones. Latest black velvet centre panel design with white embroidery. 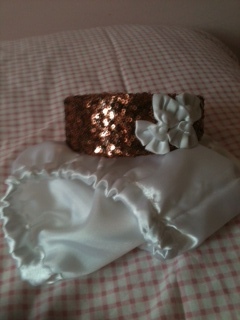 Fully lined with white cotton, the under skirt is soft white tulle. 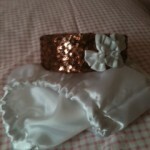 Sold complete with matching wide copper alice band with white bows and white satin bloomers. Approx 2/3″ let out in bodice and sleeve length.